This page provides a basic method of creating a SWOT analysis mind map to help you evaluate the strengths, weaknesses, opportunities and threads regarding to your career plan or a business project. A SWOT analysis mind map is an effective way to carry out this evaluation, because it can integrate so many information in one diagram, and also enables you to see the connections of each part. 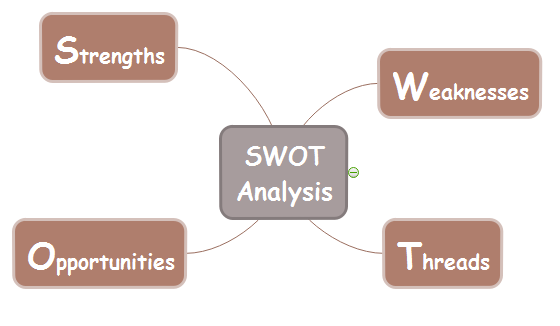 SWOT analysis is mainly applied in a career plan or a business project plan. The aim is to determine the strengths, weaknesses, opportunities and threads that a person or a company faces. And those four factors can evaluate not only internal but also external influences related to the specific project or strategy. As shown in this mind map, a SWOT analysis mind map consists of four factors. Strengths and weaknesses are internal factors, while opportunities and threads are external factors. By analyzing the four factors can identify the strong and weak points of your subject, therefore helps you make the right decision to achieve your goal. To create a mind map for SWOT analysis, you need to ask questions related to each factor, and then find answers to those questions. What strength points can people see? What is unique about this project or product? What weaknesses could be improved? What problems could be avoided? What are the factors that could damage this project? Does this project have limited resources? What are the opportunities for the company if the project succeeded? How can strengths be turned into opportunities? Are there any changes in the market that could bring opportunities to this project? Are there any existing or potential competitors that could influence the project? What could put this project into risk? What problems could possibly threaten the project? Will there be any changes in the market that could damage the project? Listing these questions could help you to evaluate the situation in order to find a winning method. Once you have found answers to these questions, you can start structuring your mind map. 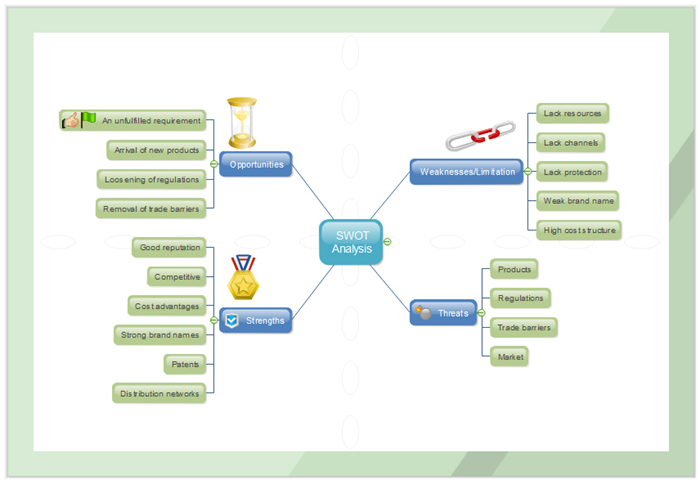 The SWOT analysis mind map below is created by Edraw. This mind map shows us how mind map for SWOT analysis could be structured. The mind map consists of 4 branches: S for strengths, W for weaknesses, O for opportunities and T for threads. The details that represent the current situation of a project or a company are listed in sub-topics. To better evaluate the situation, the map has to be as detailed and thorough as possible. A SWOT analysis mind map is one of the most effective way to help companies or individuals understand the strengths, weaknesses, opportunities and threads that they are facing. It can help us identify where to find opportunities and how to turn ideas into success.